There are many dangers associated with playgrounds. Some of it related to supervision, some related to your basic accident, and a lot of it related to playground equipment and design. The Consumer Product Safety Commission (CPSC) notes that each year more than 200,000 children visit the emergency room as a direct result of injuries acquired from playground equipment. To get the full scoop on playground dangers check out this great piece on playground hazards. While your playground is in the design stages. During the playground building process. Bi-yearly to check for new issues. Using a safety checklist once yearly is better than nothing, but harsh weather extremes brought on seasonally can cause new damage to a playground; that's why bi-yearly is best. If an injury occurs then it's smart to assess the specific area of the playground that the accident occurred in. 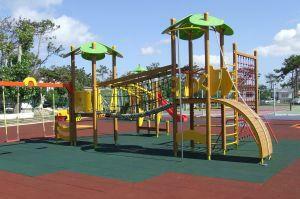 Playground safety can be divided into a few areas, such as playground design, child supervision, and play equipment. The National Safety Council has released some specific top dangers related to playground safety - this is a smart place to start building an ideal checklist. Surface areas: Almost all injuries on the playground are caused by falls. Because of this the playground surface area should be carefully assessed. The best surfaces are made of wood chips, sand, pea gravel, and rubber - either in shredded tire or rubber mat form. Surfaces should surround equipment with a six foot fall zone. Swings: Swings cause more injuries than any other actual equipment piece. Swings should have soft seats and be placed at least 24 inches apart. For little ones, only full bucket swing seats, not half seats, should be installed. Slides: The first check you should make regarding slides, is that there's nothing to snag a child at the top of the slide. Many children get snagged, caught, and then hurt because strings on their clothing, especially drawstrings, (like those on a hoodie) get caught on a rough slide. Slides should also be firmly anchored and have good hand rails on the steps leading up to the sliding platform. Merry-go-rounds and seesaws: Honestly, who hasn't has a merry-go-round accident growing up? Merry-go-rounds can be really unsafe. Both merry-go-rounds and seesaws need to be assessed for well attached hand grips, no snags (such as rough metal), and of course both should be situated on a safe surface. It's extra safe to have a tire under each seesaw seat. Safe climbing checks: Climbing equipment should always be assessed - and technically almost anything at a playground can be climbed on, so that means a complete equipment check. Visible signs should be placed that state proper climbing age. For example, children under four years should not use climbing equipment or horizontal ladders - they're not developmentally coordinated enough for this task. Climbing ropes need to be securely attached at the top and bottom. Monkey bars: Yes, monkey bars could be included in climbing equipment, but monkey bars are dangerous enough to be in a class of their own. Most experts now recommend that monkey bars simply be removed from the playground entirely. So many accidents occur on them, that a basic playground safety checklist won't help you here. Parents, caregivers, and teachers, need to be vigilant when supervising children on the playground. No matter how good your checklist, supervision is a vital component of playground safety. Watch for exposed concrete and other trip factors like cracked sidewalks and tree roots protruding from the grounds. All railing needs to be placed less than 3.5 inches apart or more than 9 inches apart, or a small child's head could get stuck between the bars and choking or death can occur. Always check playgrounds for sharp edges or broken equipment that results in sharp edges. Make sure your child's school district safety rules include a solid school playground safety component. An excellent article regarding facts on playground safety. CPSC has a gigantic playground safety resource page with free articles and guides to download. The invaluable guides cover issues like smaller child safety, safety alerts, bike helmets on park paths, and much more.